Tech giants aren’t the only companies that are able to deliver truly amazing gadgets, and Knocki is one great example to sustain our statement. The project was launched on Kickstarter on May 17th, and up until the end of June, it raised over $1 million. It’s no surprise that the project became so popular because the gadget that is going to be manufactured with the help of the funds raised in the last few months is able to turn any surface into a smart one. That is pretty cool, wouldn’t you say? Knocki is a quite small wireless device, that looks both fun and elegant at the same time. At first glance, it reminds us of a box of powder, or face cream, but it actually is a truly amazing device. That is because it can transform any surface into a remote control. With the help of this little gadgets, users will be able to control music, light, different smart devices only by tapping on the surface the gadget is placed on. It can turn tables, walls and other surfaces into the remote control you will never have to look for again. All users will need to do in order to turn different surfaces in their house into remote controls is to set up a Knocki device on them. After the gadget is set on a table, or a wall, the aforementioned surfaced basically turn into touch surfaces and allow users to control their smart devices, lights, music and more only by tapping on the wall, table or what not else. This little gadget can also help users find their smartphones, which can come in handy on numerous occasions. Turning the light on and off, controlling the climate of your home, activating security alarms, controlling smart TVs, smartphones, and different smart equipment around your house has never been easier. 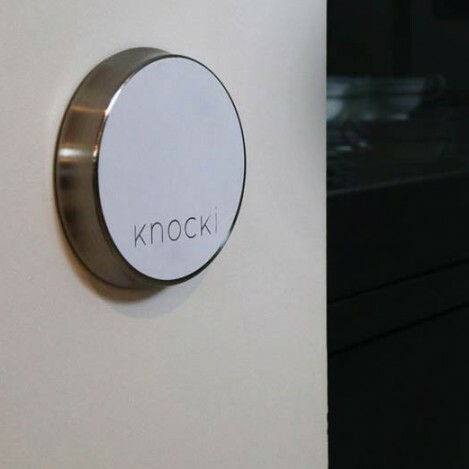 Users can also use Knocki for alerting them whenever someone knocks on the door, they receive an email, and for texting roommates or partners whenever they enter or leave the house. The gadget is really easy to set up, given the fact that it can be mounted on almost any surface with the help of removable tape or screws. Users can set them up in plain sight, or they can mount the devices under or behind different pieces of furniture. Given their slick design, it’s almost a pity to hide these little gadgets, but in case users don’t want everyone to see them, they can easily conceal them. 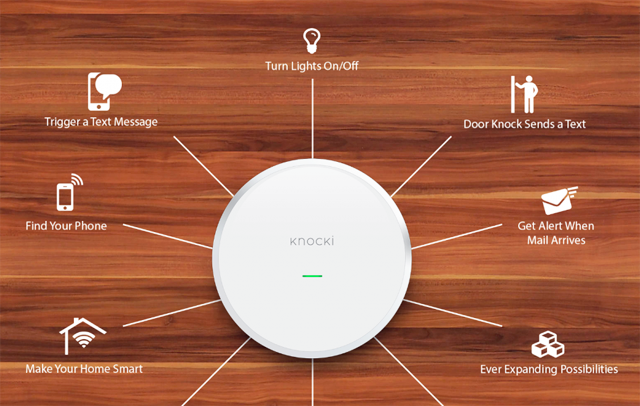 In order to make the gadget work, users will first need to connect it to their WiFi network and then use the free Knocki companion app to link all their devices and accounts. After defining the gestures (tapping or knocking) that will be used to control different devices, users can enjoy their new “remote controls”. The gadget works with both iOS and Android smartphones. The price of this gadget started at $79 on Kickstarter for early birds and went up to $99, but its $129 market price isn’t high at all either, given the multiple possibilities the device offers you. It can be especially useful for people who suffer from different illnesses or conditions that don’t allow them to easily access switches, buttons, or even can’t see. This little gadget can definitely make everyone’s lives a lot easier, and even more fun.